My outfit details: c/o Matchback.org D.A.R.E. tank top (similar here), black leggings (similar here), sports bra (similar here), New Balance Sneakers, sunglasses watch (similar here), and Anthropologie Bucket Bag (similar here). Let’s talk about Retro and Throwback Fashion! When you think of ‘80’s style, what comes to mind? For me, I imagine bright, neon colors, leggings, big hair, and crazy makeup…and, of course, anything worn by Madonna. And for 90’s style…we all know this one: over-tweezed eyebrows, plaid skirts, dark lipstick + lipliner, and one of my favorites (as pictured) – the classic and iconic D.A.R.E. shirts. 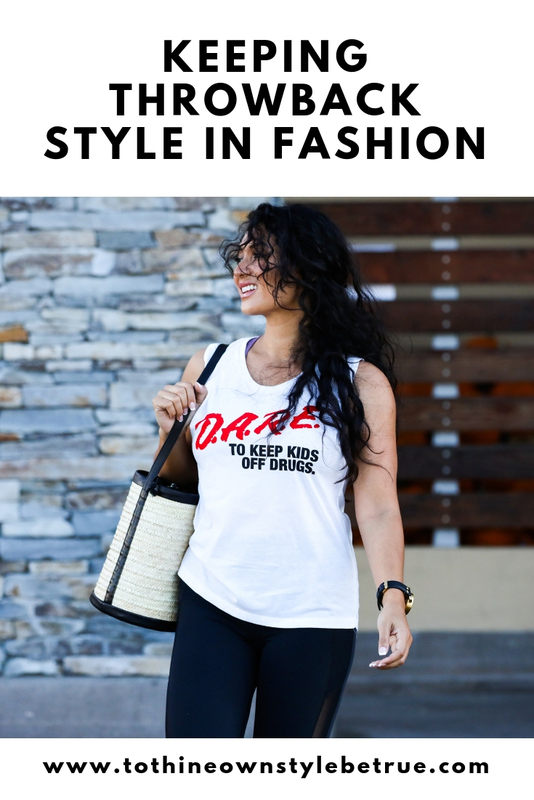 Since the ‘90’s, D.A.R.E’s campaign branding has become a mainstay in retro fashion and a favorite between both niche and mainstream artists, fashionistas, and bloggers…including me! Why I love this shirt so much: not only is it super comfy and trendy, but the organization that produces these shirts – aka MatchBack.org – even donates clothing to a teen-in-need with the purchase of every item from them. Yes, this shirt is stylish and a cult-favorite, but it’s also a wonderful way to give back! Now…let’s talk about retro fashion – particularly, the ‘80’s and ‘90’s. Just because these times have passed, doesn’t mean we have to let their fashion fade away! Take a look below for some quick ideas on how to bring ‘80’s and ‘90’s fashion back into style. Tell me: What do you think about retro and throwback fashion? Would you wear pieces that you once wore in the ‘80’s or ‘90’s, or keep them in the past instead of bringing them into the present day? Let me know in the comments below! Thanks for reading. Stay nostalgic! So weird seeing the D.A.R.E logo! I’m really into throwback athleisure wear at the moment. It’s super comfortable while pregnant! So weird seeing a dare t-shirt! I’m loving athleisure wear in throwback styles. It’s super comfortable while pregnant! I lived in overalls in my high school senior year. So comfortable, too!! I love outfits that feel a little bit retro. Your sneakers are so cute too! I wore my mom’s 80’s sweaters for a Christmas party! Does that count lol?! Those DARE shirts are so iconic!! I still have mine from my elementary school presentation back in the day! I love the retro styles. I like the overalls! Oh that is so good. You have tempted me to shop again! Ahh, I haven’t thought about DARE in so long! What a throwback! 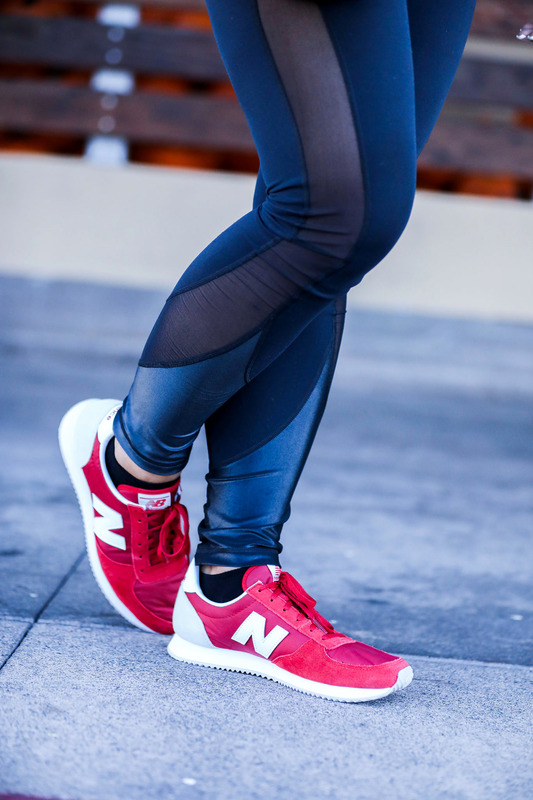 I love this athleisure look! I am a member of Generation X so this definitely brings back memories. Great retro look!